I recently took a spin through my previous blog posts to make sure I sounded literate. After confirming that, yes, they’re written in English (and my photo skills need some serious work), I realized something else: They’re a little repetitive. “I had X, Y, and Z ingredients” (usually veggies) “and I didn’t know what the eff I was going to do.” (Pardon my French.) It’s no surprise, however, since this is representative of my style of cooking. I kind of just wing it based on what I have or what appeals to me from one day to the next. It’s odd, though, when you consider the fact that I’m an obsessive planner and list maker. But I suppose cooking is the one area where I can completely let go and allow things to happen organically. (You know, after I look through 20 versions of the same recipe.) It also has to do with the fact that I recently made the commitment to try, as best I can, to consume all of the groceries I purchase each week in order to minimize food and dollar waste. So I’m always looking for new ways to combine whatever I have on hand. Funny thing is, when I plan meals I tend to have more waste than when I fly by the seat of my pants. (When I figure out why that is I’ll be sure to fill you in.) I also find that it’s mentally easier to take things one meal at a time than attempting to come up with five meals in one planning sesh. This buy-what-you-want-and-figure-it-out-later method makes it much easier to use ingredients based on what’s in season. While you can have a rough idea of what’s available different times of year, you really don’t know what nature’s sporting until you take a lap through the store and see what’s available. So I could plan until my fingers cramp, but I could show up at the store and find they don’t have a crucial ingredient I need (or they do, but it’s from New Zealand). Of course, my style is infinitely easier to execute when you’re only cooking for one or two at a time. But for me, this is what works best right now so I’m going to keep rolling with it. And that’s why last night’s dinner followed a familiar pattern. 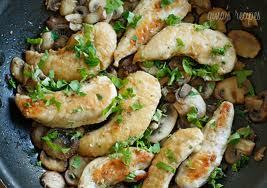 On my refrigerator shelf: mushrooms that needed to be consumed ASAP and a boneless skinless chicken breast. (I still have the squash and beets from Sunday’s farmers market, but they can wait until later this week.) I put my Google skills to work and landed on a winner (one for which I had all of the ingredients): Chicken and Mushrooms in a Garlic White Wine Sauce. Um, yes please! Bonus: It took 15 minutes to prep and cook, making it an ideal weeknight meal. If I were a menu maker this would totally be on it. The dish reminded me of chicken marsala, but with cleaner, lighter flavors and infinitely less butter. Heat a large skillet on medium heat with 1 Tbsp olive oil and 1 tsp butter. When hot, add chicken. When cooked, set aside and cover with foil. Add another Tbsp of oil to the skillet. Saute the garlic and onion until fragrant (about 2 minutes). Add mushrooms, salt and pepper stirring occasionally until they cook down and become golden (about 5 minutes). Add the wine and chicken broth and stir with a wooden spoon, breaking brown bits from bottom of the pan. Cook until liquid reduces by half. This entry was posted in Chicken, Vegetables on September 28, 2011 by Paige Greenfield.